Strange size this, a 750 ml (24 fl oz) bottle of beer, 6.7% ABV and 201 calories a serve size, this would be 3.96 standard drinks in NZ. It is a large bottle, they drink big over there. It has its origin in a Samoan folktale in which a woman revives her dying lover by carrying water to him in her hands. It’s an education sp far, so what could go wrong. For no reason I thought a handle would be the best glass for this. The handle was a present from 2013. It needs a run out now and again. Crikey, that smells of stale pubs. Seems well carbonated. Strong malt. 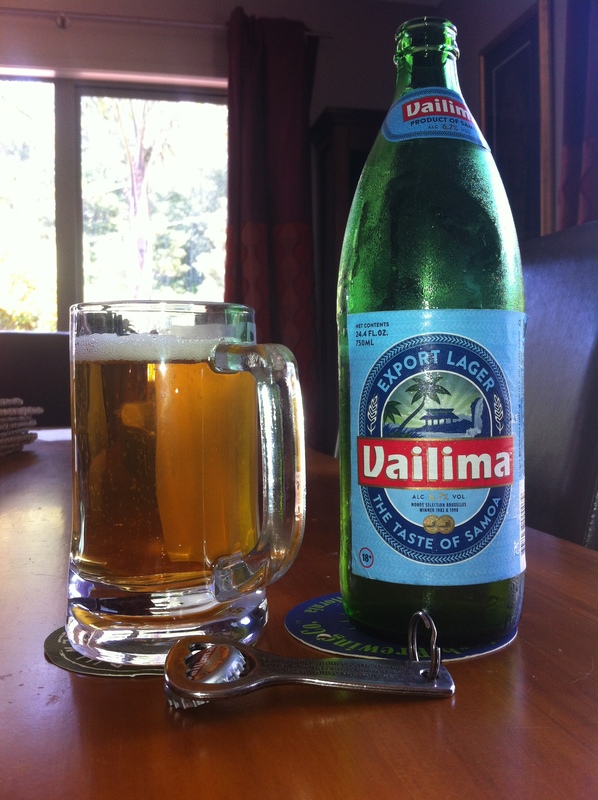 It is a very noisy beer, very well carbonated, all hiss and bubbles. smallish head, but I was expecting that. The aroma is, at best, peculiar, It looks ok though, inviting golden yellow. The taste is, at best, peculiar. I don’t know how to begin to untangle this. There seems to a lingering and persistent under-taste to this, or perhaps rather the taste in this is peculiar and lingering. Not totally awful but then not totally palatable either. 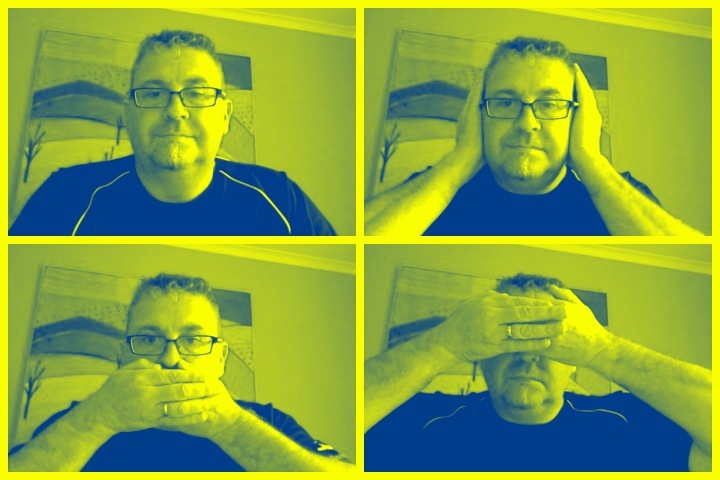 This is also the ‘Special’ export version, I pity the locals. So whilst I think this is very sweet I also think that the flatness of the palate replaces any hop character that you might be expecting to find. Also for a lager I was expecting a hop bite. I’m right on that I think. Seems them a lot of malts and a prudent amount of hops might be used in this, which would explain the neither one nor ‘tother taste. Not, for me, a quaffing beer. At this volume and this ABV it is a beer that will get you from straight to squiffy in a dash. Not for the faint of heart or the weak of will. The pdubyah-o-meter rates this as only a 5 of its things from the thing. Not a total disaster, and hey it ticks off another country on the beer world map. On the bang for buck this is bulk over substance, Like all things the more you drink the duller your palate gets and begins to accept the style and profile, I’m sure a few days in the sun with this would be acceptable, and I’m sure it’d go really well if I had some spicy food to entertain me too. Am I enjoying it? What’s not to like. Well quite a lot really, but this isn’t that bad that I’m going to toss it out. Would I have another? Not i na hurry, then again I’m not by a pool in Samoa where the answer would be probably or yes. Would I share with a friend on a porch and set the world to rights? I’d never turn up to your house with this, or offer it from my fridge, it might be like giving an American a Sam Adams, just not the done thing. Available to listen all the good places, its very mellow but might leave you needing a little more. Most commonly found in Poland, but also in other European countries as well, especially the East. These are essentially stronger versions of pilsners, though the increased malt and alcohol will noticeably reduce the hop accent. Because these are usually all-malt, and comfortably hopped, they are easily distinguishable from malt liquors. Without the malt character of bocks, these are worthy of a style all their own. 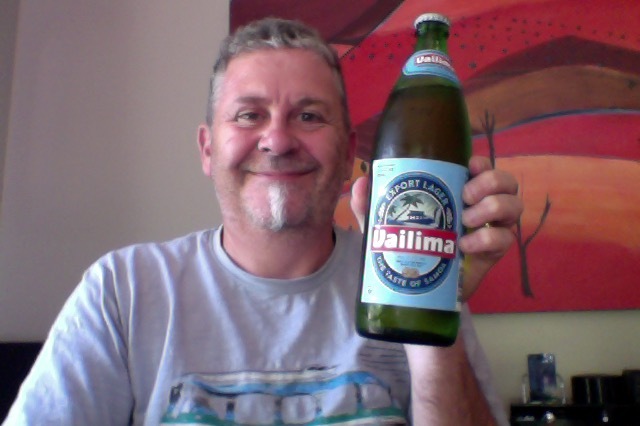 This entry was posted on January 31, 2015 by Philip Walter in Beer, Beer of Samoa, Beer Review, Craft Beer, Critic, Justsaying, Strong Pale Lager/Imperial Pils and tagged Apia, JJ Cale, malt lager, Vailima.